Powerful Winter Storm Sweeps East After Blanketing The Midwest The storm is bringing snow, ice, freezing rain and arctic air to much of the East Coast. 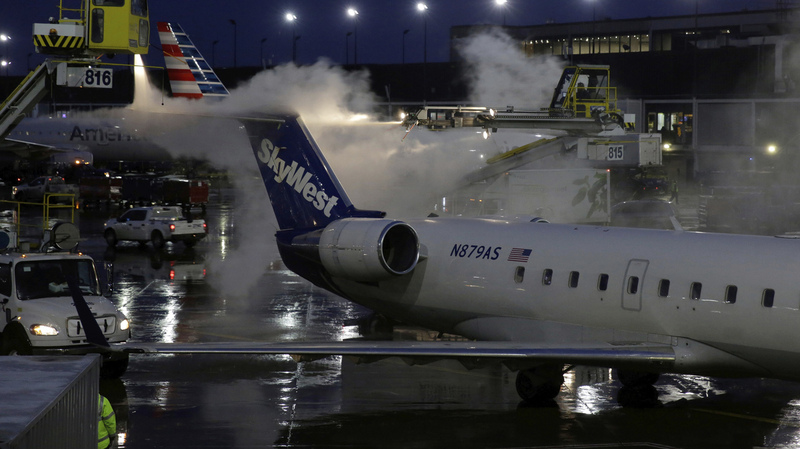 A deicing agent is applied to a SkyWest airplane before its takeoff on Jan. 18, 2019, at O'Hare International Airport in Chicago. After blanketing much of the Midwest in snow, a winter storm is now moving towards New England, with more than 100 million Americans in its path. The storm is expected to drop snow, ice and freezing rain in many places, and forecasters say temperatures will fall quickly afterwards, as arctic air envelops much of the East Coast. "Snow amounts have been locally over a foot in Iowa, up to 10 inches so far in Illinois, up to 5 inches in Kansas, up to 4 inches in Indiana, up to 8 inches in Michigan and Missouri and just over a foot in Wisconsin," David Roth, a forecaster with the National Weather Service, told NPR. The storm has already resulted in dangerous travel conditions in many parts of the country. On Friday, a Southwest Airline plane skidded off a runway in icy conditions in Omaha, Neb. In Kansas, a driver with the state's Department of Transportation died in a crash south of Kansas City, the New York Times reported. In Iowa, the Department of Transportation says visibility dropped to less than half a mile in many locations. More than 7,000 flights have been delayed, and more than 1,500 flights cancelled, according to the flight tracking sight FlightAware. As the storm moved east, officials in New Jersey and Pennsylvania declared states of emergency. In Albany, N.Y., the National Weather Service said snow could fall at a rate of 1 to 3 inches an hour, creating "difficult to impossible travel conditions" in areas. In New York City, three to six inches of snow may accumulate, followed by rain that could turn to ice as temperatures fall. Inland areas across the Northeast and New England will likely see accumulation of up to 2 feet of snow. Meanwhile, in the South, more than 10 million people face a risk of severe weather, including severe winds and tornadoes.